We've rejoined "civilization" in a town called Victoria Falls. A hotel room with running water was a luxury that we didn't take for granted today. 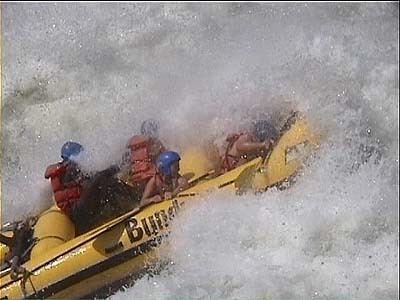 Victoria Falls should be renamed Adrenaline City; it provides many activities for thrill seekers. 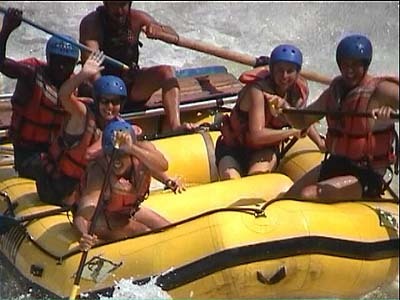 We went white water rafting in the class 4 & 5 Zambezi rapids, a river famous for being deep and turbulent. These rapids also have the danger of crocs. We saw a few along the river. The guide assured us that the crocs don't swim in the rapids, only in the slow moving, pool-like sections. We didn't swim in those much. Our guide said he'd never lost anyone to crocs, but recently he had an encounter where a croc tore apart a life jacket that trailed behind the raft. 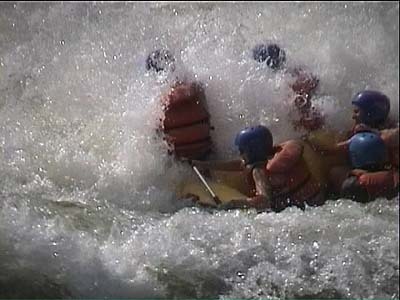 Because the water is deep, we also tried river boarding down the rapids. It was fun using a boogie board to surf the waves, even in class 4 rapids. Coming to the end of each rapid on our boards, we would quickly swim over and board the raft for safe passage over slow moving water. With our boogie board we'd make a crunchy croc treat. Our river trip was made surreal when we discovered the body of a Zambian tourist. The man had been exploring along the river's edge when he slipped into the water and drowned. He'd been missing for two days. The strangeness lay in the fact that we, a group of tourists, discovered the body. We suppose that the local authorities had thought crocs would have eaten it, so there wasn't a need to search for it. Also strange was the matter-of-fact attitude of our guide, who told us to keep paddling.